." I'm addicted to my music, so when people ring me up and say, 'Come out tonight,' they don't understand that distractions are the last thing I need. We didn't even have a holiday for six years because we sensed something was happening. If you stop in mid-air and lose the impetus, all that struggle is lost." Enya, or Eithne Ní Bhraonáin as they call her in her hometown of Gweedore, Co. Donegal could almost literally be described as 'a breath of fresh air'. This singular 27-year-old, whose Watermark album has sent many a sensitive soul into raptures and sold a cool 300,000 copies, seems completely at odds with her chosen profession. By her own admission, Enya neither listens to music nor owns the means to do so. She's never bought a record and while her own sound is ideal for CD, there isn't even a secret stash of Kate Bush and Cocteau Twins hiding in the suburban Dublin house she shares with her managers Nicky and Roma Ryan. Enya's initial reaction to the number one success of Orinoco Flow was to "stay indoors with the door locked and the phone off the hook. I find greater pleasure in being in the studio. That always brings me back to reality. Things like Top Of The Pops are a bit of a shock to me. I'm not used to that world at all." 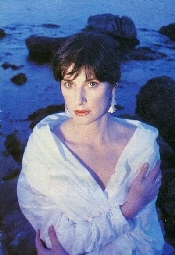 You may have heard the distinctive Enya melodic brew, a subtle meeting of electronics, Gaelic traditional folk and the secret ingredients of a voice multi-tracked to perfection, on such recordings as The Frog Prince, a score commissioned by movie mogul David Puttnam, and The Celts, BBC TV's popular quasi-documentary series on mystic Ireland. In fact Enya's career dates back further still. As the fifth of nine children, she has an older brother and sister in Clannad, not to mention a few uncles, and was once a member of that illustrious troupe herself between 1980 and '82. The teenage Enya left Clannad in bizarre circumstances. Brought in to play keyboards and lend a harmony by Nicky Ryan, then managing Clannad, she was summarily whisked away when they discovered their protégée was being paid peanuts and treated, as she says, "like the perennial kid sister". Add 'musical differences' to a family squabble and you have the makings of what became a music business scandal in Eire. As Enya and the Ryans also refuse to mingle with Dublin's hipper crowd, there have been strange mutterings about their methods. "We don't enjoy the night club scene, mainly because it has nothing to do with our working schedule," says Enya firmly. "Some people get offended by that and accuse Nicky of keeping me locked away. That's ridiculous. I'm under no pressure from anybody except me to make music; my own choice. When you're given a deadline you have to get on with it but the Ryans certainly don't manipulate me or think through me. I find that idea very offensive." Certainly nobody's fool Enya and her friends share a liking for simple pleasures. "My upbringing was very quiet and happy. I went to a national convent school where I boarded and developed a love for music, Latin and art. I wanted to be a music teacher, or at least study the subject further, and never really imagined I'd join Clannad because they were so much older than me. That experience did give me a taste for travelling and live stage work." After three years experimenting in the Ryans' home-built Dublin studio, landlady Roma took her lodger's tapes to London and played them to film producer Puttnam. In retrospect Enya, a hard task mistress, wasn't pleased with what he did to The Frog Prince. "It was orchestrated against my wishes. The Celts was the first time I felt a complete freedom to create my sound. Now, with Watermark, we're all doing what we planned on long nights spent endlessly discussing our futures. Nicky has had these ideas for ages so when he asks me to sing a part sixty or a hundred times I love it. We are very perfectionist." Enya doesn't view her solo success as her ultimate ambition. "My real love is for soundtrack because solo females don't always last long in this business. I want to be able to fall back on film or TV work. I enjoy that most." Soundtrack is a logical extension of the evocative sounds on Watermark. "It's the challenge of conjuring music for scenes which you only know as rough sketches that appeals. I'm too self-conscious if I'm being directed. What I write has to be 100 per cent me. "I'm addicted to my music, so when people ring me up and say, 'Come out tonight,' they don't understand that distractions are the last thing I need. We didn't even have a holiday for six years because we sensed something was happening. If you stop in mid-air and lose the impetus, all that struggle is lost." It's tempting to see this dark Irish beauty as some kind of driven character from a novel by Wilkee Collins or Emily Bronte. She has no boyfriend, would rather curl up by the fire with a cat than go to a party, and writes reflective songs with Roma Ryan about childhood, Celtic ghosts and the landscapes of Donegal, the Wild County of legend. This wistful nature stems partly from the fact that Enya is a native Gaelic speaker from a very close-knit community. The Uillean pipes move her more than a thumping bass riff, and she attempts to use "only nice sounds, in music and language. If words sound hard or the riffs jar with the mood, we just don't keep them in." Not surprisingly, Enya finds the London music scene a trial. Warner Records boss Rob Dickins, who signed her and then found himself mentioned in the lyric to Orinoco Flow, believes that "she isn't the sort of artist who needs development. She's complete as she is. I find her mesmerising in the same way that The Cocteau Twins can be, but it's no use explaining that to her and it would be foolish to make her listen to the competition. She'd only feel that what she was doing might be derivative." For her part, Enya doesn't want to be typecast as a dreamy romantic. "I love the countryside because it's in my blood. It isn't something I've affected. A lot of people want to be in the country for the wrong reasons. They have money, so they buy a house in the middle of nowhere, but they can't appreciate it." A purist and highly moral person by nature, Enya does set great store by meeting her public. "I did a PA in Dublin, one of those signing things, and I enjoyed it so much. Everyone had a different comment to make. One girl had sketched a portrait of me which I found very moving. Another boy brought me a box of buns and a hotel porter in his late seventies hugged me and gave me a box of chocolates." 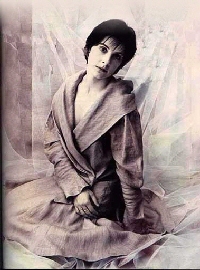 Away from such praise, no matter how genuinely felt, Enya insists: "My love of silence means I must be allowed to be on my own sometimes, to have moments when nobody is allowed to interfere. But I'm not precious about it. We have blazing rows in the studio between the three of us when we're working. We often think everybody else will reckon we're mad, that they won't like what we do. The rows clear the tension." Enya will talk happily about keyboards and sampling if you ask her, yet she also knows that "there has to be a personal and emotional contact. We use a lot of technology but the human element is where the true feeling of my music lies. The voice is the spontaneous instrument." Catching herself sounding a trifle too idealistic, Enya chooses to change the subject. "Aren't you going to ask me, will chart success start to change me?" she asks without a hint of a smile. After six years under wraps it's a question she has often asked herself of late. "It does mean that I'll be financially more comfortable; it's nice to know that. Now I can have a place of my own. It's got too busy for us here. Cars have started driving past the house and the phone never stops. I don't like that, it makes me feel hemmed in. "I'm only just getting used to people even knowing who I am. It's a very odd feeling." Note: Originally transcribed by Dave Allum. Tracks was a magazine given away by Woolworths with purchases of records and videos.